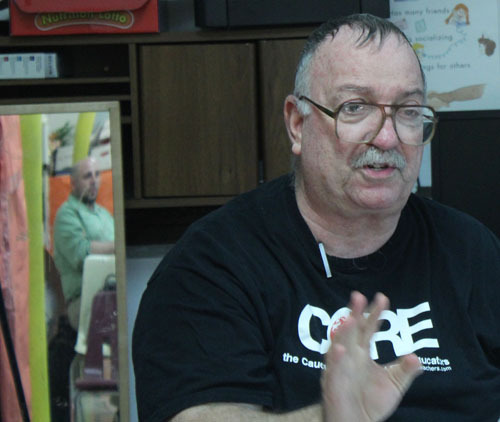 Four long-time union activists shared how the CTU fought for its contracts and how the strikes in the 1960s through 1980s produced big gains for CTU members, at a CORE forum on Chicago’s northwest side on August 8. Retired CTU field representative, strike leader, and elementary teacher Paul Odell (right) showed people at the CORE forum the original 1967 CTU contract (in his left hand) and the current 2012 contract (in his right hand) and discussed why the contracts had to get larger and larger as the Board of Education continued its hostility towards teachers and the best interests of the public schools. With Odell on the right above is retired Prosser Vocational High School teacher (and union delegate) Lotty Blumenthal, a member of the Substance staff.Helen Ramirez Odell, Carlene “Lotty” Blumenthal, Paul Odell, and George Schmidt spoke about how the union leadership and members communicated during strikes and how the union held firm the picket lines. “We’re here today to talk about how the CTU got real contracts, through real strikes, that led to real power to enforce these contracts,” CORE steering committee member George Schmidt said, introducing the forum. 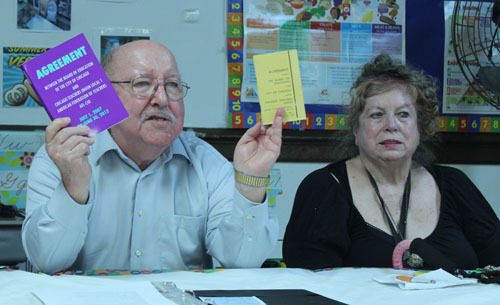 “It’s important to share, no matter how many people are here.” The forum, CORE’s second this summer, was attended by fewer people than the previous forum held in July in Pilsen. Some of the speakers on the panel mentioned sacrifices union members had to make in striking. All talked about the major benefits that the strikes produced. “We should communicate what it was like before our contractual agreement,” said Odell, who first joined the union in 1958 when he was teaching elementary school. He served as school delegate for many years then became a CTU field rep. “It is generally believed by our young folks that the benevolent board of education gave them all these things that are in our contractual agreement,” he said. 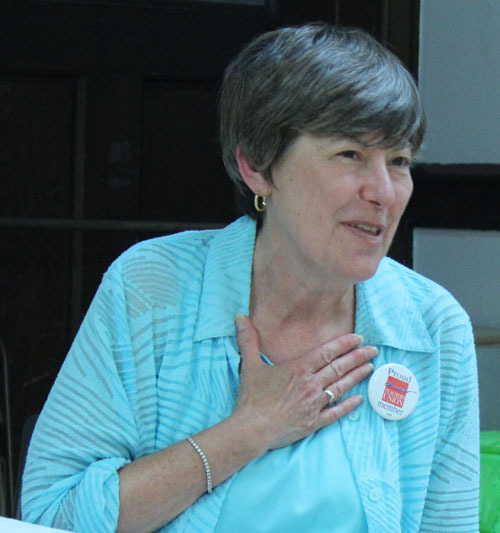 Odell listed the salary raises, health care provisions, prep times, class size limits, maternity and paternity leaves, 39-week school year, dental care, increased sick days and other benefits won by the union through each of the strikes of the ‘70s and ‘80s. “We need to remind our young people what happened historically could happen again,” said Odell, comparing the current CTU/Board of Education agreement with the first, very slim agreement from 1969. “The board wants to bring it back here.” Odell explained that the written contracts were slowly expanded with input from teachers and other union members, each item in the contract reflecting the fact that the Board of Education needed to be forced — by contract — to do things that most school districts would consider a necessity. Schmidt noted in the discussion that the contract even had to include a paragraph the says that math teachers should be provided with blackboards in their classrooms, and noted that he once had to file a union grievance when a principal assigned a math teacher to a program in a room without a blackboard. The lengthy contract that some anti-union pundits complain about, the panelists agreed, was necessary because of how CPS officials would mistreat teachers — and other school workers, from nurses to school clerks or teacher assistants — in so many ways. The most recent example of how no one can trust the Board of Education comes from 2011, when the Board voted to ignore a contractual raise of four-percent for the 2011-2012 school year because they claimed, falsely according to George Schmidt and other union researchers, that they didn't have enough money for it. The contract, everyone agreed, had to be as long as was necessary to cover what the union members would need to do their jobs. 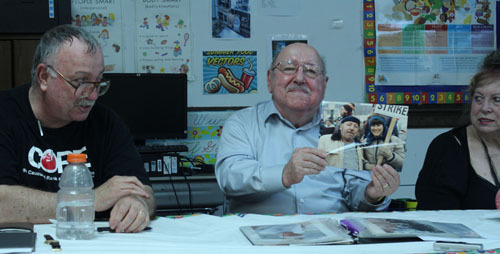 You can find love on the picket line, as Paul Odell proudly announced, sharing his photos from the strikes of the 1970s. Substance photo by Sharon Schmidt.The stories about the victories in the nine official union strikes and the resultant contracts were made more and more clear during the evening. Odell said that union members in 2012 need to know that the strikes worked. Solidarity is key. [img=5324]A lot of the discussion was about how the union members and the union dealt with scabs. A scab is anyone who crosses a union picket line during a strike. Ramirez Odell explained that the nurses really got organized when the board threatened to close the school health program in 1967. They, and later the other clinicians, have been an important part of the union ever since. She said there were only two scabs from the nurses in all the strikes, and one paid back the union the salary she had received during the strike in order to rejoin the union. The union has a procedure under which it expels any member who crosses a picket line, but only after a hearing before members of the union's executive board. Scabs are informed they have the right to a hearing, and some (not many) actually apologize and return to good standing by paying the union the amount equivalent to the number of dollars they were paid during the strike. Ramrez Odell mentioned the sacrifice members who didn’t cross picket lines made. “Sometimes it got to a choice between gas for my car and groceries,” she said. The speakers noted that the site of picketing changed from the 1960s and 1970s into the 1980s. At first, the union had to picket at every school, but by the 1980s, the Board was unable to open any schools and told scabs to report to the "district offices," where they could go and get paid for doing nothing. Schmidt noted that by 1983 or 1984, there were 24 "scab centers" — the 23 district offices and the central office, which at that time was at 1819 W. Pershing Road. (During the 1960s and 1970s, the central office had been at 228 N. LaSalle St.) During a strike, every union member needs to know where to picket, when, and how. Ramirez Odell explained that because nurses worked in several different schools during strikes they could go to any picket line where there was a need. She said often they were encouraged to picket at the Board of Education headquarters or other district centers. “Picket lines need to be really strong early in the morning when people are coming in,” Ramirez Odell said, although at the district centers it was sometimes difficult to distinguish between administrators and the members who were crossing the picket line, when picketers didn’t know everyone. Lotty Blumenthal, who spent almost all of her her teaching career at Prosser Vocational High School, was described by Schmidt as a “hard-core” union delegate. Schmidt said he first met her in 1975, when he was sent to Prosser as a substitute teacher. Blumenthal stressed the need for communication during strikes and having a headquarters for each picketing site. “You need a place for people to meet, go to the washroom, or take a break,” Blumenthal said. She mentioned businesses and even some parents’ homes had opened their doors to the teachers. "Every school's picket line needs a strike center," she repeatedly told the group. Where the strike center was depended on the community and location of the school. The overall strike center is at the union's downtown headquarters. In the days before electronic communication, Blumenthal said the headquarters needed a phone where strikers could reach the union offices. In addition, she spoke about driving around delivering “On the Line,” the union’s daily strike paper. Because the daily newspapers and corporate media always reports information that distorts the reality of the strikes, "On The Line" and other methods of communicating with strikers became a life and death issue for strikers. As did the other panelists, Blumenthal recounted positive stories of working with police, who did not harass strikers but upheld their right to picket. Blumenthal noted that former students become police officers, and others note that many teachers are married to cops. It was important, all agreed, that pickets not provoke the police, but equally important that pickets make their displeasure clear to scabs. [img=5325]Schmidt, who during the ‘80s and early ‘90s had led an opposition to the union’s United Progressive Caucus (UPC) leadership, said that during the strikes unity came first. “Jackie (Jacqueline B. Vaughn, CTU president from 1984-1994) and I had our disagreements, but on a strike there were no factions,” Schmidt said and gave examples. He also noted that today the new leadership was bridging the differences that had been within the union. Odell and Ramirez-Odell had been members of the UPC for most of their careers. Schmidt shared stories about the strikers working to prevent scabs from crossing the picket lines by having large and boisterous picket lines and blowing the "scab whistles" that everyone carried. He noted the “accidents” that sometimes occurred to scabs’ cars when they crossed the line. At Lane Tech, a scab center during the 1987 strike (which lasted 19 days) Schmidt noted that there were "meteorological mysteries" that took place during the nights of the strike, including one night when it rained roofing nails on the driveway that goes to the Lane Tech parking lot off Addison St.
Ramirez Odell also recalled that strikers would cover scabs’ cars with "Scab Stickers." These sometimes rained two or three on a car windshield, bearing slogans like “A scab is lower than a snake’s belly.” Odell noted that there were a number of Scab Stickers, depicting reptiles and rodents, but that strikers had to be sure that the correct vehicles were identified before strikers showed their displeasure with the scabs driving them. Schmidt noted that during the strike, the union school delegates had to be very careful in reporting scabs to the union's central office. "No scab can be reported without the delegate and at least one witness signing the report sheet," he told people. "Our reporting has to be very precise, because a scab will be labelled for life." Paul Odell talked about how infuriating scabs were and that once at a “scab center” (a place where teachers would go to sit all day without students and collect their paycheck). He admitted that he once “lost his cool” and was arrested for allegedly saying too much heatedly to a scab. But fortunately, he told the group, one of the police officers was a former student. “It was enraging. They got paid, we did not. And then they got paid the make up days, too. They got double pay,” Odell said. George Schmidt speaks at the CORE forum. Participants included Nate Goldbaum, CTU member communications coordinator and one of the CORE caucus co-chairs (left, in mirror). Substance photo by Sharon Schmidt.The panelists talked about how the members needed to communicate with one another during the strike with phone calls and schedules for picketing. Not all strikers picket all day, they all pointed out. After the most important hours, during which a scab could swipe in to get paid for the day, a skeleton crew can take over. “Communication is so crucial,” Odell said. “Obviously, you must have a dynamic leadership. I do believe Karen Lewis is that. And the rest of the union staff. Everything is important from leadership down to staff to delegate to teachers. Failing that the union can’t go anywhere, anyplace, anytime. As Substance readers may recall, John Kugler on July 24 had a story about costly appeals being made by CPS in the Corey H case which was about to end. Based on several filings made by lawyers for CPS in the last week, it appears that CPS is going to file an appeal to the US Court of Appeals for the 7th Cir. As John pointed out, the District level Judge in this case was upset with CPS; this appeal he described as both needless and costly. Now CPS is planning on paying its outside counsel even more money to continue this litigation. As I pointed out in a comment to John's article, CPS sees winning this case as putting lid on special education class action cases against CPS.